I wanted to make my husband a special dinner for Valentine’s Day. My husband is a wonderful man. He makes everyday, a Valentine’s Day for me and I love him incredibly. We first met in August, 1998, at our college, SUNY Buffalo. We lived on the same floor in the dorms and were constantly thrown together, socially. That November, we started dating. We spent 4 glorious years in college together and after that, many years in a long distance relationship. It was difficult but we were good friends from the start and that friendship pulled us through our long distance relationship. For 8 years, we lived for when we could be together. We both wanted to complete school and get settled first. Finally, September 12, 2010, we got married. It was a beautiful wedding, at the Pearl River Hilton. Everything was perfect and all our friends and family were there. So, even though this was our 13th Valentine’s day together, it was our first Valentine’s day, as husband and wife. I love my husband, with my entire body and soul. He makes me a better person and a happier person. Thank you, my wonderful husband, for making me so happy. I love you dearly. 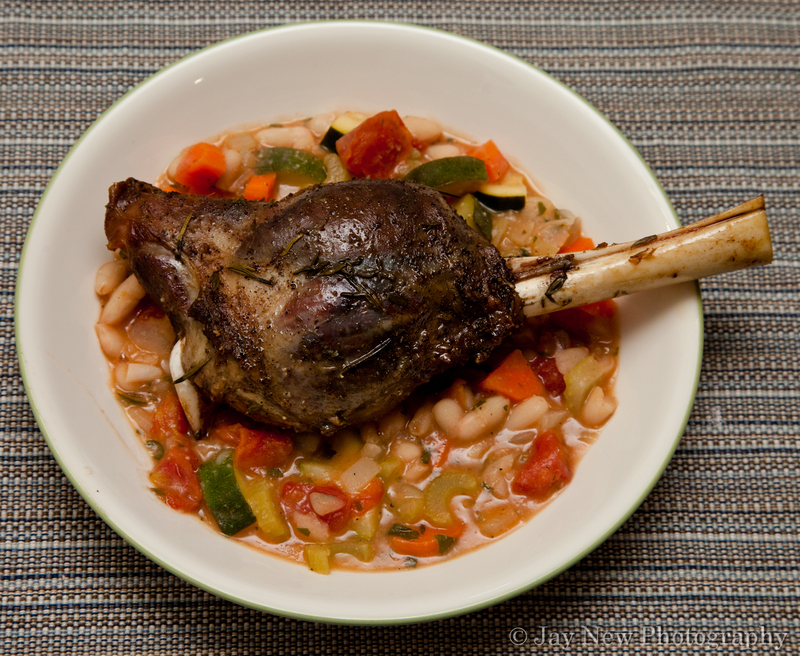 For our Valentine’s Day dinner, I made an Oven Slow Roasted Lamb Shank over Cannellini Bean Stew. In an oven-safe pan, place 3 long layers of aluminum foil. Place first layer, lengthwise, the second layer cross (making a plus) and the last, lengthwise again. You want 3 sturdy layers. Starting from the inner layer of foil, enclose lamb in the three layers of aluminum foil, making it airtight. Allow lamb to rest for at least 10 minutes before serving. Wow thats a lovely Valentines dinner and may the two of you have more happy years and Valentines day together! That story is so beautiful. I love happy endings and you and your husband are definitely that :). And this slow roasted Lamb.. TO DIE FOR. Anything that is slow roasted.. I am there lol. You really keep me cooking throughout the week and I have to say Thank You 🙂 *HUGS*. You make your mother-in-law the happiest woman on earth.. I love you Samina with all my heart… and stomach. Thank you mom! I love you with all my heart too!